Has anyone got any recommendations for transporting up to four bikes on a Berlingo? -Boot mounted racks are probably the easiest to load, but cause problems with boot access and bikes bashing the car/each other. Four bikes are also going to be relatively heavy. I would need electrics for a tailboard. -Roof mounted solves the problems above, but the height of a Berlingo might make loading/unloading difficult. I imagine that these cause a lot of drag and wind noise. -Tow ball mounted. Apart from the obvious issue of not having a tow bar at the moment, these seem to be a good (if rather expensive) solution. Putting the bikes in the car is not going to be an option as I need the seats and the boot. 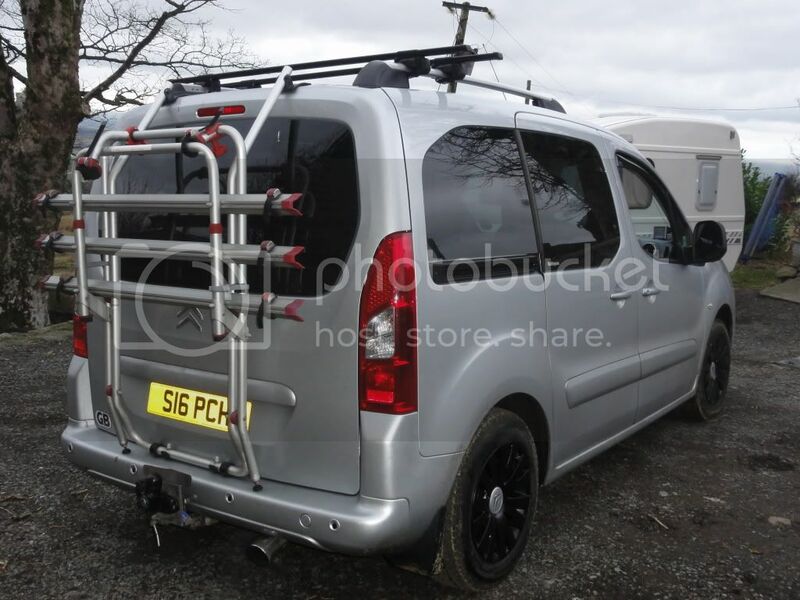 There was a 2 bike tailgate mouted rack available for the pre '08 berlingo supplied by Citroen, so you might be able to order these still. Towbar mounted bike racks which hold the wheels & have their own lights are best imho & best solution for 4 bikes but 4 bikes+carrier could well exceed the Belingo max towbar download(noseweight)of 70kg. The hanging type towbar rack needs a lightboard as well. I think your solution would have to be 2 bikes on roof & 2 on back. Bikes on a Berlingo roof are rather high & loads of drag tho. Would add that I have a Dutch made Spinder 2 bike towbar rack & it is excellent but a 4 bike rack might be over the noseweight limit depending on bikes. see if this piccy works, if not moderators ...help. as you can see number plate visible, rack cannot be nicked, legs are supported on bumper , I can still lift tailgate with 2 bikes on. But does need to be held up [with em on] Otherwise brill. It is a VW T4 camper bike rack with a couple of inches cut of top tubes [i did this, so not difficult] so it didnt stick up too high for when I also want to get my 2 canoes on. The issue of "nose weight" is a bit confusing to me (happens easily), in that I don't see much difference between having 70kg pushing down directly on the tow bar, or having 70kg pushing down through a bike rack directly above it? Is there more to it than that? The bikes are mountain bikes, so relatively heavy. My preference would be to keep them off the roof if possible and avoid issues with wind drag, height clearance and not forgetting what that weight up high does to the car's handling. Pete, I like the look of your set-up. Your rack, mounted directly to the car, certainly looks very stable and secure. It would also save on having to fit a tow bar for the time being. yeh if you check fiamma site , maybe they have berlingo ones now, but I doubt it. Mine cost about 140.00 plus extra for fourth bike, [ only 3 showing in picture]. If your near n.wales your welcome to view. (09-02-2011, 02:53 PM)Chris Wrote: The issue of "nose weight" is a bit confusing to me (happens easily), in that I don't see much difference between having 70kg pushing down directly on the tow bar, or having 70kg pushing down through a bike rack directly above it? Is there more to it than that? Theres no difference, you need to keep to max 70kg on towbar & a tailgate mounted rack would impose a similar load. Any car will have a max towbar download limit to avoid rear axle overload so I suppose the weight limit would apply to a tailgate rack as well. Whatever method you used to carry 4 bikes on the back you would need to find an axle weigher to check that with bikes+your normal luggage & passengers you wern't over on back axle. Apart from stressing rear suspension an overload would make front end light which is not desirable in the wet. I find that 2 bikes on the back is noticeable on corners & certainly care would have to be taken with 4 bikes on back. That's a good point; bikes plus luggage plus kids all starts to add up. I don't think that suggesting a carbon bike is going to go down well so I think your suggestion of two on the back and two up top, might be the way forward. I guess this principal applies to all cars with bikes on rear. Funny how you dont see police stopping many of them......same as number plates with letters / numbers miss placed in order to read something. If the ba---tards[police] got out of their vans / cars and stopped filming speeders and went after bad number plates etc, I for one would be happier.